A short explanation on the new marketplace: in our previous versions, the prices were basically set by the requestors. On the other end, providers were only able to set the lowest amount per task they would be willing to work for and then the requestors would just accept any and all offers that made it to them first. With the new marketplace, the accent has been shifted to the providers who are given the option to compete with others with both their prices and reputation. In this revamped marketplace, providers vary their offered prices depending on how well they’re faring on the market at the moment — increasing the prices when they receive a lot of offers and decreasing them when they are getting starved for tasks. Requestors, on the other hand, are given a short time after the task is published to the network to gather offers from the market and choose those that best suit their needs. For the full description of how the new Marketplace works, please read our original Marketplace research blogpost. Regarding the other major update, “Docker for Windows” is now the default supported version of Docker on Windows 10. This new release uses the native Hyper-V hypervisor, which should provide a more stable environment for Golem nodes and improve the application startup time. Even though Docker Toolbox is still supported, it needs to be installed manually, and we cannot guarantee the aforementioned environment performance. As usual, we encourage you to use the latest software versions and features. We are not yet done with the updates though! We have completed Golem’s support for all Concent Service use cases and finalized all the features required for Golem to be successfully integrated with it. So far, all Concent-related functions are enabled and available only when launching Golem on testnet. They will be enabled on mainnet, only after the Concent Service itself is officially launched into the Ethereum mainnet in one of the future releases. Among the smaller UX improvements, we were able to: add the ability for users to set their preferred gas price within Golem’s wallet when performing withdrawals, enabled requestors to restart selected frames on finished tasks and we also simplified the allocation of resources. In addition, you’ll be happy to find a sleeker wallet design, a new transaction tray, clearer provider statistics and easier access to Golem’s logs, and better error reporting on the front-end. We have also made fixes to Golem’s installation and initialization, plus several other minor fixes and improvements to both Golem’s back-end and front-end, as well as to our command line interface. On the provider’s front-end, we have updated the success counts to be better aligned with the actual success/failure criteria as recognized by the requestors. This should make the matching between the reported successes and actual payments for subtasks more straightforward. For those interested in an even more detailed changelog, it’s always available in our official GitHub repository, alongside the details and troubleshooting information. Should you encounter issues, don’t hesitate to contact us through our Rocket channel, reddit or e-mail at contact@golem.network. We greatly value your feedback and do our best to include your opinions in our decisions so that, together, we can make Golem stronger, better and more efficient. Detailed instructions on how to install Golem on your computer can be found on our project website. To upgrade from earlier Golem version, please consult the instructions below. If you’re upgrading from versions prior to 0.19.x, be aware that Brass Golem Beta 0.19+ uses Docker for Windows. Docker for Windows comes with a new type of virtualization support: Hyper-V (Windows Server Virtualization) in place of the old Docker Toolbox. This virtualization change should provide a more stable environment for Golem nodes, but it does not come without difficulties. Please be aware that if you are using any other virtualization software (for eg. 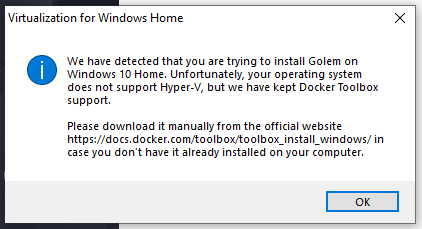 Docker Toolbox, VMware), do not to install Hyper-V as this could potentially impact performance. Also if you are a Windows 10 Home user you will not be able to install Hyper-V as it’s not supported. Fortunately, we have kept Docker Toolbox support in this case. The only downside is, that you will have to install Docker Toolbox manually from now on (download here), as it’s no longer part of the install package. 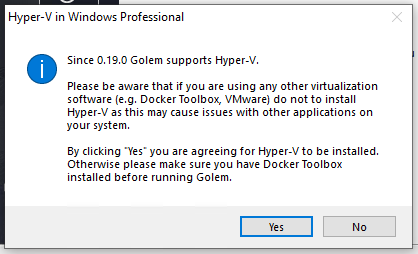 If you encounter any problems with Hyper-V you can still uninstall it, and try to run Golem with Docker Toolbox. If any errors occur during any process, please let us know in the testers channel at chat.golem.network or write an email to contact@golem.network (make sure to include “Error” in the subject field so we can catch it quickly). With those simple steps in place, you should be running the latest release of Golem for macOS. Afterwards, just update Golem normally, using the instructions for 0.18.x above. cmd + space bar, type docker and hit enter. Confirm that Docker is running properly. If you encounter any issues with Docker for Mac please follow instructions on Docker for Mac github.